How to fix the blue screen error in windows. Windows blue screen error is telling something is happened wrong in your computer. when blue screen is coming then computer is restart automatically and lose some data that yo have working on computer. There are many difficult to say that what is the reason of blue screen error on computer screen . there are many reason for blue screen error on computer. It will be on hardware problem , Software problem, drivers problem or virus maybe. You also read this :- Error 0x00000709. How to solve Printer is not set as default. What is the reason for blue screen error on your computer. There are difficult ton say one of the reason for appear blue screen error on your computer screen. But there are few reason for blue screen error. 3. Installed new software on your computer. 4. virus is infected on your computer. 5. Some external devices is not working properly. You also read this :- The Local Print spooler service is not running error how to solve. 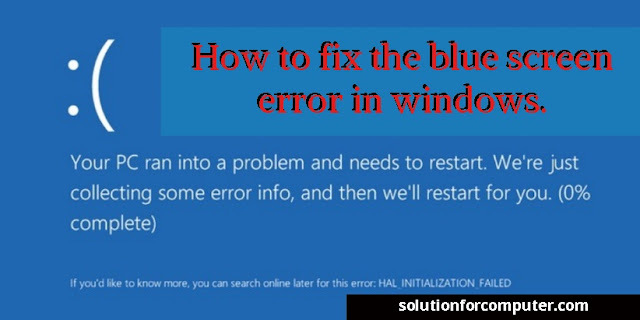 1.Fix blue screen error by check software in computer :- Some times you install any third party software on your computer or that software is not compatible with your OS. that is the reason of blue screen on your computer. so make sure that if you have install recently any software that is not compatible or not working properly than uninstall this software and check your computer your issue is resolve or not. 2. Fix blue screen error by Check your hardware :- you should check your hardware is this working properly. it is vary difficult to check you a hardware problem . But i am asking you this problem is come when your some hardware is working properly that's is Hard disk drive , RAM or Graphics card if that's is installed on your computer. so just replaced your hard disk or ram one by one if your have another . Otherwise contact any professional. 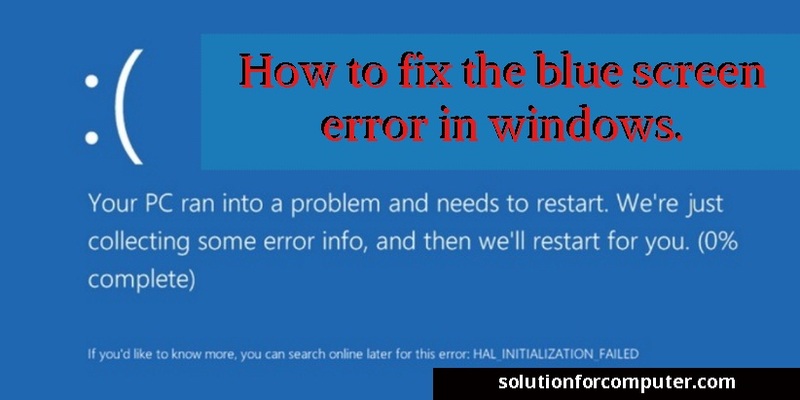 3: Fix blue screen error by uninstall drivers:- There are one of the vary important reason for blue screen on your computer is updated or outdated drivers. So check if you have recently installed new driver or updated any driver . So you need to uninstall that's driver in your computer if it is not compatible with your computer. After that check your computer your Blue screen issue is resolve or not. 4. Fix blue screen error by Checking virus. :- Virus is may be one of the reason of blue screen error on your computer. In that cast you need to install a good antivirus on your computer. I suggest quick heal antivirus is good one. you can update quick heal antivirus offline but that's is not matter you can any good one. after that complete scan your computer. and check your issue is resolve or not. 5: Fix blue screen error by check external devices :- Many times you thing when blue screen is come that is the problem of your computer. But that is the reason of blue screen is external devices like pen drive , USB printer or other USB devices. So you need to check when blue screen is come that's time you have connect any external device with your computer if any so remove it and then check your issue is resolve to not. 6. Fix blue screen error by reinstalling windows :- If you have done everything so you need to be reinstall your windows OS. and reinstall your all drivers and software. But before that you need to be backup of your computer data. I hope this post is helps you to solve Blue screen error on your computer. If this post is useful for you and you like this post please share this post with your friend on Facebook, twitter, Google plus and more .Please comment your experience about this post in comment box , and you also follow us by email and other social media .